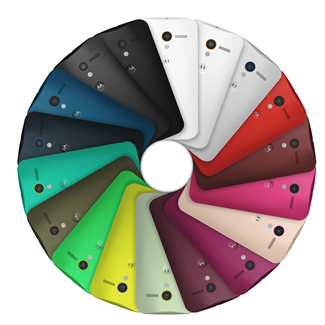 One of the coolest features for the Moto X is Motorola's Moto Maker system, a website that allows buyers to customize the color of the front, back, and accents for the phone. At launch it will only be available for the AT&T model, but Motorola is planning to expand availability to other carriers later in the year. Check out the video for the system below. Verizon has already confirmed that they're getting access to Moto Maker, via a tweet from the official Verizon News account. Motorola has already stated that they plan to offer black and white face colors and 16 rear/accent colors, plus more colors and exotic wood backs later in the year. What I really want to know is whether or not Verizon and other carriers will have access to the 32GB model that AT&T is getting ($249 on contract, if you're curious). The 16GB starting storage for the Moto X isn't going to cut the mustard for a lot of users, especially since it won't come with a MicroSD card slot. The Moto X will be available in North America in late August or early September for $199 on contract. A Google Play Edition will follow at some point.